An adult female deer tick. A female deer tick (left) and a nymph deer tick. On the cusp of spring, temperatures are still dipping below zero and snow covers the state of Maine. This long, drawn-out winter is taking its toll on many Maine residents — in the form of Vitamin D deficiencies, cabin fever and seasonal depression — but it doesn’t affect everyone. The recent below-average temperatures aren’t likely to make a dent in the local tick population, according Maine tick experts. The opinion of these Maine experts lines up with a recent study conducted by the University of Rhode Island’s Center for Vector-borne Disease and TickEncounter Resource Center. The center’s director, Thomas Mather, and his team conducted a series of tests to determine if ticks can withstand the frigid temperatures of recent months. At first, results were encouraging. They placed adult female deer ticks in a freezer at -2 degrees Fahrenheit, and the ticks died within 24 hours. But the second series of tests took place outdoors, under the snow — the ticks’ natural environment. Not only did the ticks survive, they started moving after a few seconds warming up in Mather’s hand. “Underneath the snow, it’s probably a mild 25-28 degrees, not anywhere near cold enough for death to result,” Mather said in a YouTube video produced by InsectShield, a company that produces insect- and tick-repellent clothing. It only needs to be about 40 degrees Fahrenheit for hibernating ticks to wake and become active, Kirby said. In the spring, they emerge and start seeking a host or “bloodmeal.” They can’t fly or jump, so they wait for their next meal in a position known as “questing.” Clinging to vegetation with their back legs, ticks hold their front legs outstretched and wait for an animal or person to walk by. Some ticks attach to the skin quickly, while others wander, looking for places where the skin is thinner, according to the Centers for Disease Control and Prevention. In Maine, it’s deer ticks (also known as black-legged ticks) that people generally worry about. Deer ticks can transmit Lyme disease, an infection that can affect the joints, heart and nervous system if left untreated. In the northeast, approximately 25 percent of deer ticks in the nymph stage of development have been found to have Lyme disease, according to the American Lyme Disease Foundation. 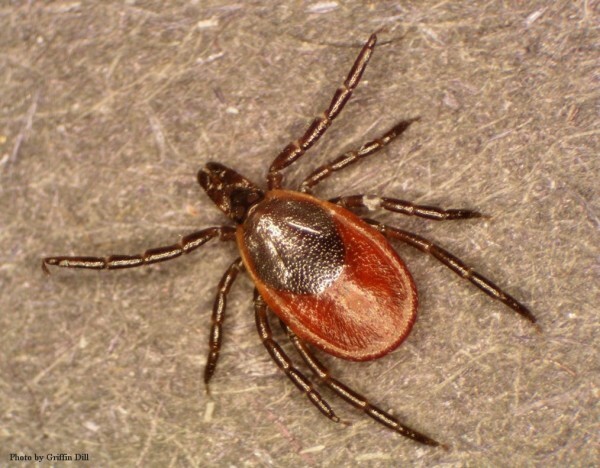 The deer tick first appeared in southern Maine in the 1980s, migrating up from southern states. Since then, deer ticks have spread their range throughout the state, first along the coast, then inland. They have now been found in every county, though their numbers are far fewer in northern Maine, according to the MMCRI Vector-borne Disease Laboratory. “My advice to anyone out there hiking or bushwhacking is, as soon as we have bare ground and it’s into the low 40s or higher 30s, it’s time to do tick checks when you get out of the brush,” Kirby said. Check your clothing and skin for ticks before getting into your vehicle or entering your house, Elias said. It’s also a good idea to conduct a second check, before you go to bed, and a third check the following morning. Good lighting and enlisting a tick check helper may increase your chances of finding any latched-on ticks, which at the dangerous nymph stage are about the size of a pin head. “If you miss it right away, chances are a tick might still be on you and looking for a suitable place to bite,” Elias said. 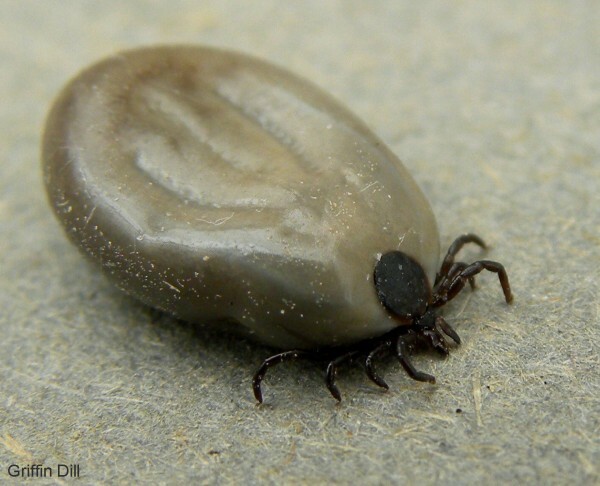 If you do find a tick latched onto your skin, you should remove it as soon as possible. For a deer tick to transmit Lyme disease, it must be attached to its host for at least 24 hours, according to the CDC. Some people use tweezers or tick spoons to aid them in the process, but the main goal is to remove the tick entirely, without leaving any parts behind that could cause an infection, then thoroughly clean the bite area. In addition to deer tick, Maine is now home to a number of tick species, including dog tick, winter tick and woodchuck tick. If you’d like a tick identified, you can sent the specimen or photos to the UMaine Cooperative Extension Tick ID Lab. The lab’s website also includes some information on tick species, management and removal — and they’re in the process of adding more tick-related content. “Some years, we’ve had ticks brought into the lab as early as the last two weeks of March,” Kirby said. To deter ticks from landing on you in the first place, cover up as much skin as possible when outdoors. Wearing light-colored clothing might help you spy a tick before it reaches your skin. Certain insect repellents, such as DEET and Permethrin (which is sprayed on clothing, not skin), can also deter ticks. For more ideas on how to defend yourself against these harmful pests, visit Maine Medical Center Research Institute at mmcri.org and select the Vector-born Disease information pages or visit the UMaine Cooperative Extension Tick ID Lab at http://extension.umaine.edu/ipm/tickid/.